Spatial Economics Research Centre in LSE. A FRESH meeting was organized in Trinity College Dublin on November 7, with the aim of bringing together researchers involved in work that combines both economic history and economic geography. There were an excellent array of submissions, covering a host of topics from factor price convergence across space to the clusters and the spread of new technologies. The workshop opened with a keynote address from Professor Kevin O’Rourke, Chicele Professor Economic History at Oxford. His talk, based on work undertaken with Alan Fernihough (Queens, who was also in attendance), was entitled ‘Coal and the European Industrial Revolution’. The research traces the link between coal and population growth in 19th Century, exploiting in particular a geological instrumental variable. After a coffee break, the first session, entitled ‘Market Integration & Regional Inequality’, began, chaired by Rowena Gray (UC Merced). 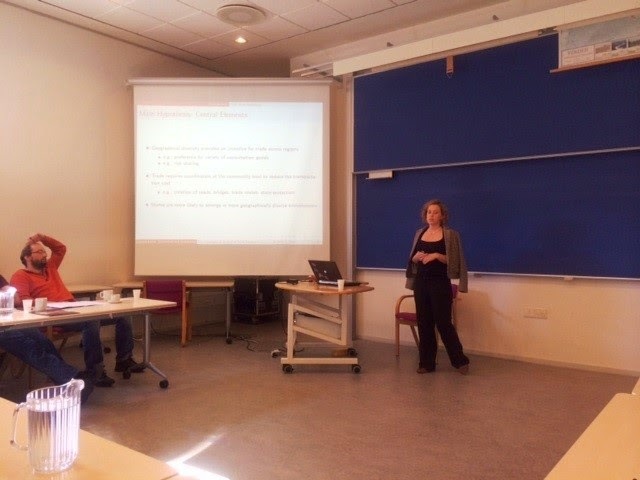 Kristoffer Collin, a graduate student from the University of Gothenburg, presented a paper entitled ‘Convergence in real regional wages for manufacturing workers in Sweden, 1860–1990’, part of a broader stream of work on Swedish cliometrics taking place at Gothenburg. Next up was Alfonso Diez-Minguela, from Universitat de València, whose presentation explored the potential impact of agglomeration on regional growth in Spain, during the period 1870-1930. 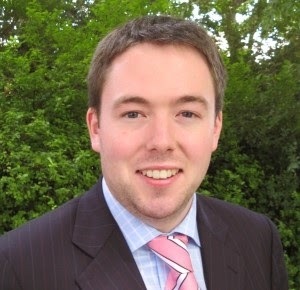 The third presentation was by Alexis Wegerich, a DPhil student from Oxford University, who presented work on integration – or lack thereof – in the global market for bunker coal, during the period 1840-1960. The final presentation before lunch was by Michael Pammer, of Johannes Kepler University, who used an administrative dataset to explore the contours of inequality in Imperial Austria in 1911. After lunch, the second session, Alan Fernihough (Queens University Belfast) chaired a session entitled ‘The Economics of Land and War’. The first presentation was by Ronan Lyons (of Trinity College Dublin), who presented a new housing price index for Dublin over the period 1900-2014. He was followed by Jørgen Burchardt, of the National Museum of Science and Technology (Denmark), whose talked was entitled ‘When industry and homes moved to cheap land’. The third presentation in the session was by Matthias Blum (Queen's University Belfast), who discussed research on Protestant and Catholic welfare during the First World War and how it may support Max Weber’s hypothesis. The final talk in the second session was by Thilo Huning, a graduate student at Humboldt-Universität zu Berlin, whose paper was titled ‘How Britain Unified Germany - Geography and the rise of Prussia after 1815’. A coffee break followed, after which the final session began, entitled ‘New Frontiers of Economic History’ and chaired by Matthias Blum, of Queens. The first paper was by Harry Kitsikopoulos, of NYU, who presented on the factors affecting the diffusion of Newcomen engines, 1706-1773. 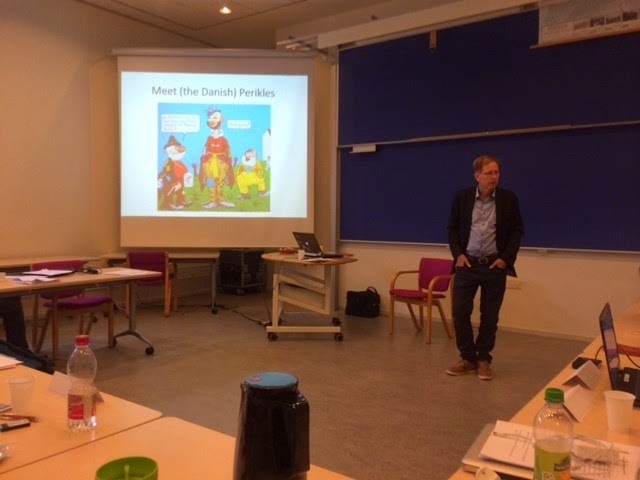 Karol Borowiecki, of the University of Southern Denmark, then presented research on well-being indices for three famous composers, based on their letters, and the link between their well-being and their creativity. The penultimate presentation of the day was given by Katalin Buzasi, a graduate student from Utrecht University, whose talk was titled ‘The long-term determinants of language development in Sub-Saharan Africa’. Formal proceedings concluded with a presentation by Fabian Wahl, a graduate student from Hohenheim University, who looked at the relationship between participative political institutions and city development in the millennium following 800AD. After such a busy day, the group enjoyed a conference dinner. This followed by some sampling of the Friday night-life in Dublin! Overall, it was fantastic to be able to bring together such a diverse group, working on a variety of interesting projects but with a common belief: that, when understanding economic outcomes, both time and location matter. Hopefully, the relationships started here will help in the submission of panels at economics and economic history conferences, as well as perhaps some direct collaboration. 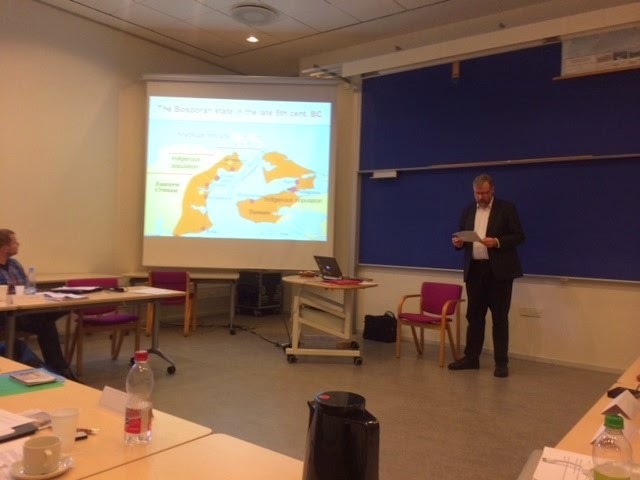 A FRESH meeting was organized in Esbjerg October 1-2 to bring together researchers in Ancient History and Economic History to share research and exchange interdisciplinary ideas. The economists and ancient historians who took part in the workshop are explicitly interested in collaborating across disciplines. Their papers covered a wide spectrum of topics and approaches and provide a comprehensive overview of the different strands of research done in ‘economics and ancient history’, with the intent of bridging the gap between humanities and social science research in Ancient history and long run development. The first day began with three presentations by Ancient historians that nicely set the stage for highlighting the differences in research scope and methodology, and the similarities in the research goals. Gregor Utz (Regensburg Univ) discussed the challenges of using pottery fragments in assessing trade through the cases of Marseille and Arles in the Later Roman Empire, and the economists in the audience wondered about the possibility of using truncation and censoring models to assist in estimating figures. Vincent Gabrielsen (Univ. of Copenhagen) gave a lively talk about the role of the Hellenistic benefactor in state finances, discussing an evolution in state dependence on individual wealth that spoke to modern issues of regulatory capture and the dynamics of political power and wealth, as financing varied from direct taxation (rare) to money lending or even Ponzi schemes. Roland Oetjen (Kiel Univ), co-organizer, talked about the ways in which we can perceive of euergetism (private provision of public goods or ‘good works’) as credible commitments of political investment. These two papers fit nicely together, using economic concepts in carefully detailed ways to elaborate on human behavior in Ancient Greece. Carl-Hampus Lyttkens (Lund Univ) gave the first day’s keynote lecture which showed how applying economic principles can help elucidate even the behavior of specific individuals in Ancient Greece. He applied a rational actor framework to Pericles’ behavior regarding his rival Kimon, essentially tracing out Pericles’ response function to Kimon’s successes. George Tridimas (Ulster) then also used game theory to discuss the fall of Athenian democracy. His intriguing model differentiates between rich and poor in their expected returns from warfare and shows how the impetus for too much war, leading to demise, stemmed from the poorer factions. Returning to ancient history, Markus Sehlmeyer (Marburg Univ) very nicely discussed the formation of the Bosporan Kingdom using collective action theory, making another nice bridge between economics and Ancient history. The day concluded with PhD students Joshua Günther and Felix Hahn (Kiel) also discussing individual rational actors Kleisthenes and Kleomenes. In their ongoing research, they are considering their behavior in light of principle-agent problems. The first days’ conversations extensively worked to share information about the application of economic models and the ways in which economic thought and modeling can augment research in Ancient history, as well as its limitations in generalizing. A lovely dinner, sponsored by SDU Department of Environmental and Business Economics, with lively conversation followed at Gammelhavn. The second day had greater focus on long run development issues from an economic standpoint. Ezgi Kurt (Bogazici Univ) presented on the roles of military technology and resource endowments in long run economic growth in Eurasia. She has collected data on dynasties and their longevity to examine political instability and growth. Tønnes Bekker-Nielsen (SDU Odense) gave a fascinating presentation on Roman road design that brought together GIS, engineering, economics, and an understanding of the limitations of these in the contemporary period to examine the evolving efficiency of Roman road design in minimizing the distance cost (physical effort) of those using the roads by minimizing elevation change. This would have matched nicely with Carl-Johan Dalgaard’s (Univ. of Copenhagen) planned keynote talk on Roman roads and long term economic development, but last minute considerations led him instead to give a more polished presentation on comparative development along North-South lines. His story aims to establish that the turnaround in development, which at earliest periods is located in warmer climes, but then moves away from the equator, is tied to quality investments in child-rearing based on thermal requirements for weaning. Thought-provoking indeed! The discussion of long run growth continued with Fabian Wahl (Hohenheim) presenting on city development and participative political institutions from 800-1800. This work provided interesting contrast to Kurt’s earlier paper and the two authors defended their positions with gusto. After lunch, Anastasia Litina (Luxemborg) also tackled long run growth issues, looking in to geographical conditions of early state formation. This work dovetailed nicely with the previous day’s presentation on collective action and state formation, and the two authors, along with many other participants, shared ideas on how to incorporate more of each other’s fields into their works. The final two presentations shared a focus on resource use and economic development. The first, by Georg Schwesinger (Univ. of Bremen), outlined a new research project seeking to develop bio-economic models of economic development and collapse in the Ancient world. The second, by co-organizer Brooks Kaiser (SDU Esbjerg), investigated the long-standing questions about the timber supply for the extensive Athenian navy in the Classical period using theories from institutional economics and resource economics. The meeting concluded with a desire to continue the interdisciplinary dialogue in future workshops. 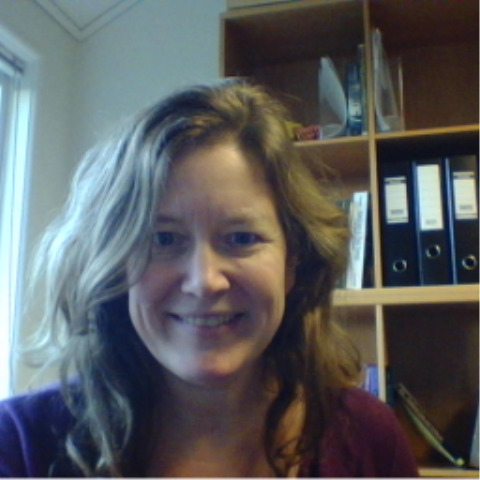 This blog post was written by Brooks Kaiser, Professor WSR at the Department of Environmental and Business Economics at University of Southern Denmark and co-organizer of the FRESH meeting. Manifested in historical accounts, songs, and family tales, the boll weevil (Anthonomus grandis), an approximately one-fourth inch long beetle with a very long snout, is considered as the most well-known agricultural pest in the American South. 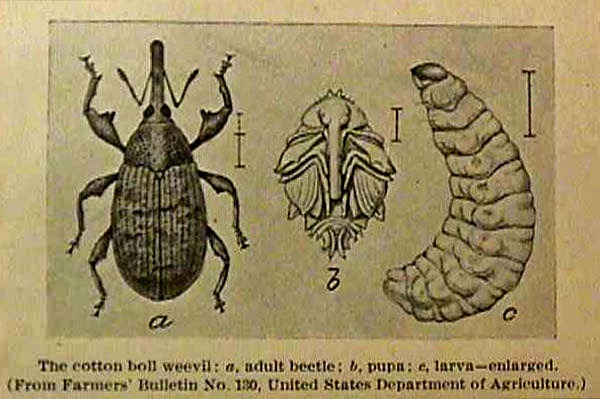 Arriving near Brownsville, Texas, from Mexico in 1892, the boll weevil started to impair the main economic engine of the South: cotton production. Depending on prevailing wind and weather conditions, the boll weevil could cover from 40 to 160 miles a year such that thirty years after its arrival the whole Cotton Belt was almost completely infested. 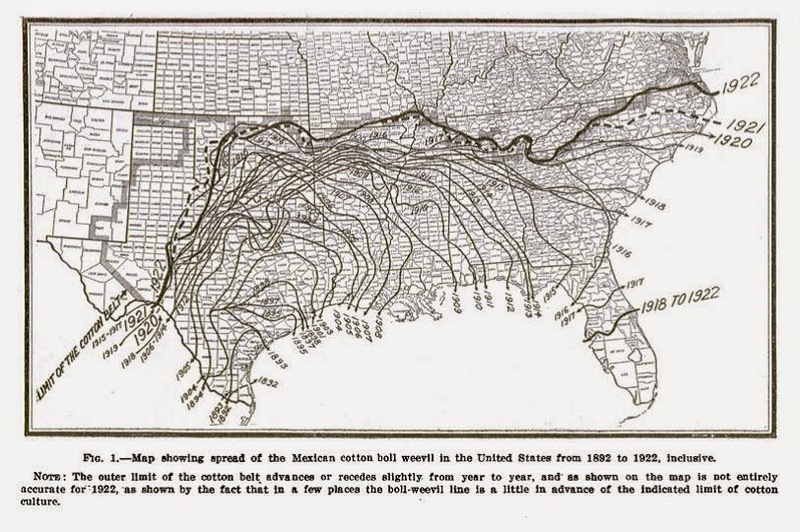 The recent EHES working paper by Ager, Brückner and Herz (2014) focuses on the Cotton Belt counties of the American South that were infested by the boll weevil during the late 19th and early 20th centuries. As the boll weevil adversely affected cotton production and hence the demand for labor, the authors exploit the arrival of the boll weevil as agricultural productivity shock to identify the response of labor supply to changes in labor income. The central message of Ager, Brückner and Herz's article is that labor income shocks had a significant effect on labor supply at the extensive margin in the United States during the 1880-1940 period. For a panel of 903 counties the authors estimate that a one percent increase in labor income increased the labor force participation rate by around 0.2 percentage points. The finding is based on an instrumental variables approach that carefully addresses endogeneity issues. The instrumental variables approach exploits that in the beginning of the 1890s, counties located in the Cotton Belt of the American South were hit by an agricultural plague, the boll weevil, that adversely affected cotton production and hence the demand for labor. The impact of the boll weevil on output per worker varied across US counties depending on the initial importance of cotton production in a particular county. Counties with a greater initial cotton share experienced a significantly larger drop in output per worker due to the incidence of the boll weevil. Ager et al. therefore use the interaction between the incidence of the boll weevil and counties' 1880 cotton share as an instrument for labor income. It is notable that instrumental variables estimates of labor supply are significantly larger than those produced by least squares regressions. An explanation for the larger two-stage least squares estimates is a reverse causal effect, which downward biases the least squares estimates. The negative reverse causal effect arises in the least squares regressions because increases in labor supply decrease output per worker as well as wages (under the standard assumption of decreasing returns to scale in labor). Ager et al. also explore alternative adjustment mechanisms to the labor income shock. They find that there were significant effects on immigration and emigration, as well as on non-market labor. Decreases in output per worker due to the boll weevil lead to significant decreases in immigration, significant increases in emigration, and significant increases in the share of housekeepers. This blog post was written by Philipp Ager, assistant professor of Economics at University of Southern Denmark, Markus Brückner, Associate Professor at the National University of Singapore and Benedikt Herz, PhD student in Economics at Universitat Pompeu Fabra.